New £16M care home facility for the Sisters of Nazareth, Cardonald. The project includes the partial demolition of the existing Nazareth House which will be refurbished to provide 50 new ensuite bedrooms. The redevelopment also includes a new build two storey ‘U’ shaped 120 Bed Care Home. The Care Home comprises 4no. 15 Bed Units per floor. In addition, 15no. 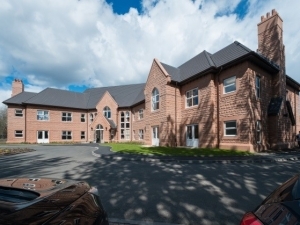 ½ bedroom apartments are provided over 3 floors connecting the Care Home to the existing Nazareth House. Secure gardens are accessed from the Care Home.